Energy & Resources Group | Will Dr. Harte’s MaxEnt lead to a unified theory of ecology? MaxEnt breaks everything that we ever thought about communities and species and ecology. … And that’s the cool thing about John Harte: He is saying, let’s keep it simple … and just with four parameters, at a mini or a macro scale, you can figure out how to describe these patterns. Dr. Harte had used the MaxEnt approach to predict the number of species in South Asia’s Western Ghats, publishing a paper on this in 2009. Results from a study in Panama by Dr. Harte and his colleagues are to be published soon. 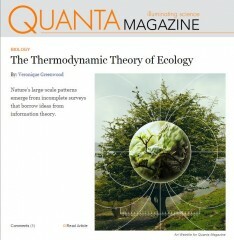 Read more about Professor Harte and MaxEnt theory in the most recent Quanta Magazine.